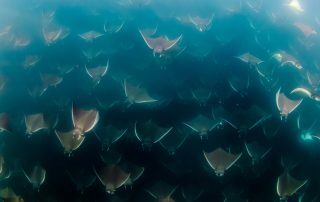 Every year tens of thousands of mobula rays visit the coast lines of the Sea of Cortez in Mexico’s Baja California peninsula. 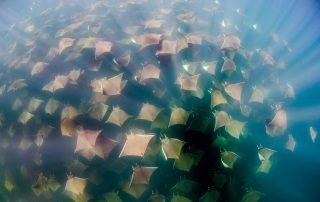 The congregations of rays are one of the most incredible spectacles on earth – and one of the largest in the world too. An event so stunning that it has been featured in BBC’s Blue Planet and in numerous National Geographic documentaries. Imagine diving down into a school of thousands of these beautiful creatures as they soar through the ocean. Witnessing their acrobatics as they jump from the water by the hundreds. Snorkeling above the massive schools as they glide effortlessly through the water in unison. This is Mexico’s Mobula Ray migration. Join Dive Ninjas this June as we team up with renowned marine biologist & scientist, Marta Palacios, for a very special series of citizen science expeditions to explore this breathtaking natural wonder.. This is a special limited offer trip with only 6 spaces available per trip. We recommend that you act fast as this trip will sell out quick. Scroll down for more details on the trip, then register online now to secure your space. Feel free to contact us at [email protected] or at +1-973-619-9976 with any questions or to reserve your space today. Check out this incredible clip of possibly the largest school of mobula rays ever filmed! Taken right here in Baja California by National Geographic for their Untamed Americas series! Prepare for front row seats to your own wildlife documentary. Our special mobula ray migration expedition not only puts you right in the heart of the action but let’s you get involved in important research being done on these amazing creatures. You will be able to partake in mobula research and surveying activities alongside one of the top mobula ray experts in the world – Marta Palacios. This is your chance to help make a difference and protect our oceans while bearing witness to one of the most incredible natural wonders on earth with your own eyes. Our expedition will begin in La Paz, Baja California Sur, Mexico. After check-in and registration, we’ll meet for our first presentation by Marta introducing us to these amazing creatures as well the research we’ll be conducting throughout the trip. The next morning we’ll head out just after sunrise for our first in-water experience. After a few hours exploring the area we’ll take a break for lunch and have our next presentation of the trip. Then get ready to head back out on the ocean for another chance to get in the water with the jaw dropping schools of mobula rays. Then the next day we’ll be back at it again and again. We’ll spend a total of 3 days in the water so you can get as much time as possible with them. While out on the ocean we’ll also be looking for other species of rays, sea lions, pods of dolphins and many more incredible inhabitants that call these waters home. The days will be pretty full on as we search for different schools and bays in hopes of discovering another nursery for these beautiful animals. Our captains for this trip are ex local shark fisherman that have converted to working purely in marine research and eco-tourism. These ninjas are living proof of the amazing things eco-tourism can accomplish. They have grown an unrivaled passion for the ocean and know the waters around this area unlike any other. Each trip will have an expert Team Ninja guide working alongside Marta to teach you about this breathtaking area in the beautiful Sea of Cortez and keeping everyone safe and enjoying themselves. We’ll spend each of the 3 ocean days swimming, snorkeling, & freediving while out searching for different schools, conducting citizen science activities, and exploring new areas in hopes of finding new nurseries. 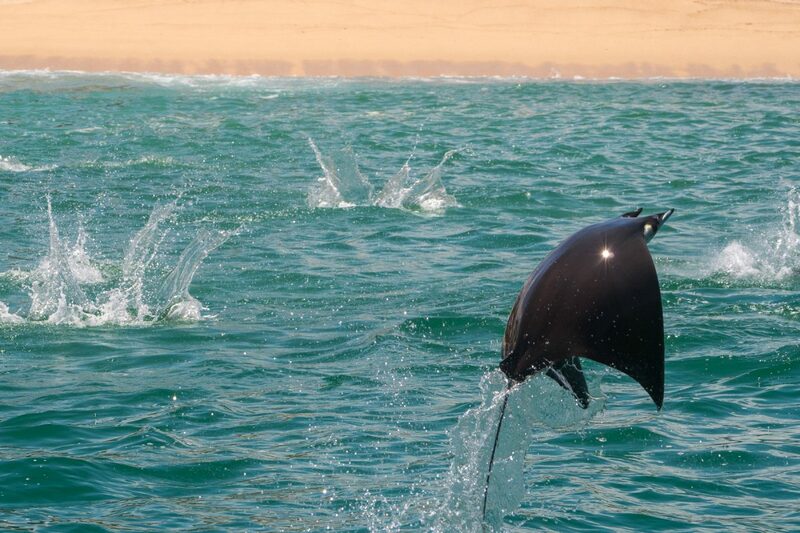 There are 5 species of mobula ray that can be found in the beautiful waters of Baja California. The Munk’s Pygmy devil ray, mobula munkiana, are one of the most sought after because of the gigantic schools they create. These epipelagic rays like their close relatives, the manta rays, are filter feeders that thrive on plankton. But unlike their relative, they have the lowest ability to reproduce out of all elasmobranchs (sharks, rays, & skates). Their delayed reproduction, giving birth to a litter size of only one pup, gestation periods of 12-13 months, and reproductive cycles of 1-3 years means they are extremely vulnerable. They fall victim to targeted small-scale fisheries and industrial fisheries where they appear as bycatch which is leading to population declines worldwide. 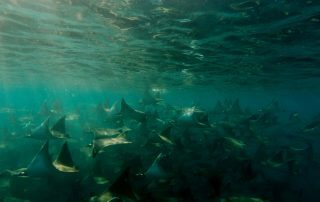 Despite the threat on their populations, very little information exists on them – stressing the urgency to study the early life stages of devil rays and their habitats. Our goal of these expeditions is not only to bring you face to face with these beautiful creatures but to explore and find areas where mating activity and schooling events for Mobula munkiana occur. One of the first nurseries ever discovered was recently found in these waters by Marta. Mating and nursery areas are highly correlated for mobula species, therefore finding new mating grounds around this region will allow us to identify possible new nursery areas. These nurseries are critical habitats for the population and with your help we are hoping to discover more and help push for these areas to be protected. You will have the opportunity to get directly involved with research activities that will help us better understand these mobula rays. Your assistance during these expeditions will directly contribute towards conservation efforts to protect these incredible creatures. 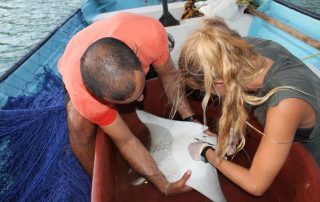 Research activities will include surveys of the abundance of rays, a census of possible pregnant females & juveniles in different areas, zooplankton tows & census, surveying microplastics in the water, observing & filming pregnant females, courtship, & mating displays, as well as collecting environmental data and more. However you are not required to partake in research activities if you do not want to. You are more than welcome to just come along to enjoy being in the water with the schools of mobulas. Below you will find the current available dates for our 2019 Mobula Ray Expeditions. Please contact us or click the button below to reserve a date. 40% of all profits from these expeditions are being donated to Mexico Azul to help fund Marta’s mobula research & conservation work! This is a special limited offer series of citizen science expeditions. There will be only 3 expeditions and each expedition is 5 days long with a maximum capacity of 6 guests. The expedition package price is $1790 USD. All prices are per person and on shared double occupancy basis. If you are traveling solo, no problem! We will match you with another solo ninja guest of the same gender. Or if you prefer your own private room a single supplement upgrade is also available for an additional fee. The trip price includes all in-water activities, citizen science research activities, presentations throughout the week, transfers from the hotel to/from boat, 4 nights hotel accommodation (3 star) on a shared double occupancy basis, a light breakfast at the hotel, lunch, snacks, & soft drinks onboard the boat, and all marine park fees. Additionally, for every guest that signs up Dive Ninjas is donating a DNA sample collection kit to test fish meat being sold in local shops around La Paz so we can help build more data on how mobulas are being sold mislabeled as other fish species in markets & grocery stores. The price does not include flights, transfers from/to airport to/from hotel, rental equipment, Crew Gratuity (10%-15% of trip price is customary but is at your discretion), local dinners & other meals or drinks not mentioned above, 8% IVA (Mexican sales tax), or credit card processing fees. Please note that this expedition is not scuba diving based. All the action takes place at the surface so there is no need for scuba equipment. 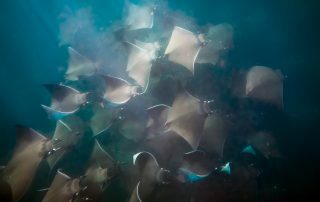 Plus we have learned through experience that the rays do not like the bubbles created from scuba equipment so the schools tend to disperse quickly in the presence of bubbles. Additionally, to better preserve the natural behaviors of these animals it is best done as a soft interaction without bubbles and heavy equipment. You do not need to be scuba certified or freediving certified to join these expeditions, but you do need to know how to swim and be comfortable swimming in the open ocean where you can not see the bottom. If you’d like to gain some experience with freediving beforehand we recommend taking a freediving course in Cabo San Lucas the days before the trip with one of our ninja instructors. It’s an awesome way to make the most of your time on the expedition! We can provide you with a transfer from Cabo to La Paz to meet the rest of the expedition group. Marta D. Palacios is a Marine Biologist with a extensive experience in the study of endangered and lesser known marine species. She earned her Marine Biology degree in the Canary Islands and during that time she had the opportunity to study in the two peninsulas of Mexico. Marta has collaborated in the research of freshwater dolphins in the Amazon, penguins in New Zealand, coral reefs in Indonesia and the diver environmental impact in Ecuador. In a collaboration with Manta Trust and The Charles Darwin Foundation, she studied the Oceanic Manta and Mobula Ray population in the Galapagos Marine Reserve where she realized the urgency of studying these amazing creatures to help in their protection. 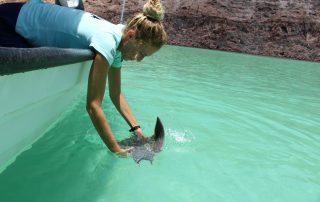 She moved back to Baja California Sur earning her Masters degree at the Instituto Nacional Politecnico with the identification and habitat use description of the first nursery area for a Mobula species, collaborating with the Monterey Bay Aquarium and Pelagios Kakunja. Our base for this expedition will be our host hotel in downtown La Paz, Mexico. The nearest airport is La Paz International Airport (airport code LAP). Los Cabos International (also known as San Jose del Cabo International Airport – airport code SJD) is a bit further away but is a larger airport with more international connections and more flight options. Guests have the option to fly into Los Cabos International but will require a transfer to La Paz. Our reservations team can help set up a transfer for you. Both airports are serviced daily with domestic & international flights. We recommend arriving a day early to give you some time to relax and a little padding in case of any travel delays. Easy flights to both airports can be found from many international and national airports, although Cabo has far more flights and options as it is a much larger airport. From the US flights are pretty cheap – especially from the west coast and southwest US. From Europe flights are very affordable and include usually a layover in the US or Mexico City. If transiting through the US please check in advance to see if you will need a US transit visa. Since you will be visiting us at our home in Baja California there are numerous options to add on local diving and activities in Los Cabos and the surrounding areas before and after your expedition. Another great option would be to take a freediving course in Los Cabos prior to the trip so that you can get even more out of the experience with the mobulas. Give us a shout and we can set up add-on packages to extend your trip to Baja. Sign Up For Secret Ninja Updates! Want to be the first to know about our new trips, expeditions, and specials? Join the secret ninja mailing list. Sign-up for exclusive info on new trips, specials, and ninja news!